Here are a few fabulous books I pulled from to create the Secret Garden Camp. This kit contains a beautifully illustrated book, a wood and metal trowel, a magnifying bug viewer, 20 wooden garden markers, and a set of 21 stickers for identifying your plants. The book offers over a dozen gardening projects and nature activities based on Frances Hodgson Burnett’s story The Secret Garden, with illustrations by best-selling artist Graham Rust. For ages 3 and up. 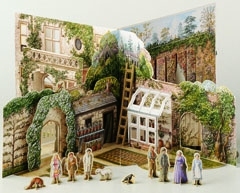 This pop up book lets you create the whole Secret Garden by opening the book and tying the front and back covers together. It is an amazing book. I bought it years ago, but can only find it on used book sites now. A great website for teaching various aspects of A Secret Garden to children.